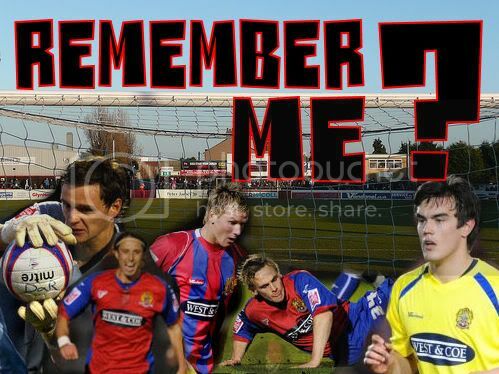 A look back at some of those lucky loanees who have worn the famous red and blue. "The Curious Case of David Button"
Toward the end of the 2008/2009 season, as we pushed toward the final play off place in only the clubs second season as a league team, an injury to our evergreen goalkeeper Tony Roberts forced the club to apply for emergency goalkeeper loan coverage. It seemed a very quick process, and for our first game of Robbo's injured spell (Bradford City, home - a 3-0 victory) a hastily arranged squad numbered and little heard of David Button (signed from Tottenham Hotspur) was suddenly welcomed as a member of our history. In the short time he spent on loan at Victoria Road the (now) 21 year old Stevenage-born player proved to be a very promising young goalkeeper, a decent shot stopper - the only part of his game which ever worried me was his ability at claiming a cross. Of the games he featured in for The Daggers, the team managed to score nine goals, conceding a solitary goal in the rearranged fixture against Brentford, a 2-1 victory against a side who eventually were promoted. His other game came in the superb 3-0 victory at Meadow Lane (Notts County) in our penultimate league fixture of the campaign. Since leaving The Daggers, David Button has appeared between the sticks on loan for Crewe Alexandra, Shrewsbury Town (where he has found his football most frequent thus far in his short career appearing 26 times), and can currently be found plying his trade at Home Park with Plymouth Argyle. Labels: FullMetalDagger, JerkFromTheCoach, Remember Me? He also sent a letter to Grays after he spent time on loan with us thanking us for giving him the opportunity to play first team football. Absolutely true that he wrote to Grays and thanked them. An absolute gentleman and was tipped for a much higher level than he is now.